This upcoming Thursday June 21st is National Indigenous People’s Day. 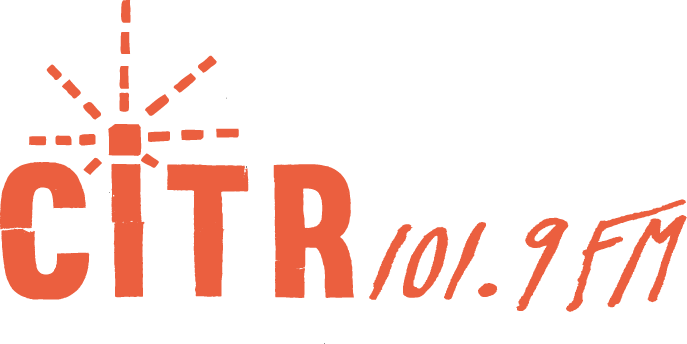 Tune in to CITR 101.9 FM to hear over nine hours of content made for, by, and with Indigenous people in our community. 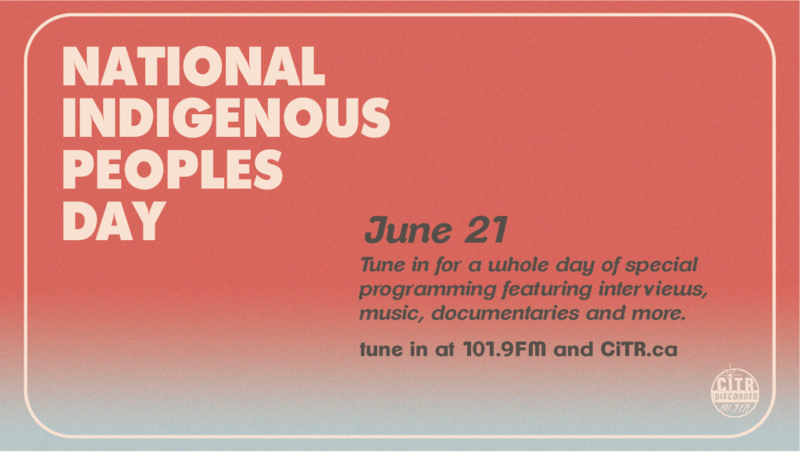 Tune in starting at 11 AM to hear our full day of in-depth documentaries, engaging interviews, and curated music in celebration of National Indigenous People’s Day 2018. Listen on 101.9 FM or online at www.citr.ca. 11:00AM: Host of the Bepi Crespan Presents… radio program presents a 60 minute feature on Montreal-based Inuit electronic music composer and digital media artist Geronimo Inutiq. Produced by Bepi Crespan. 12:00PM: Duncan’s Donuts takes us through his picks for National Indigenous People’s Day. Produced by Duncan McHugh. 1:00PM: Carving Space: Rhyme & Resilience Part 1 – a two-part conversation with Nuu-chah-nulth poet Mitcholos Touchie and Cree-Métis poet Samantha Nock. Produced by Rachel Lau. 1:30PM: Carving Space: Rhyme & Resilience Part 2 – a two-part conversation with Nuu-chah-nulth poet Mitcholos Touchie and Cree-Métis poet Samantha Nock. Produced by Rachel Lau. 2:00PM: Carving Space: Wellness Reclaimed – An exploration of the ways that Indigenous women are creating positive change in mental healthcare for B.C.’s First Nations communities. Produced by Chloe Price. 2:30PM: Carving Space: Navigating Indigenous Identity at UBC – Members of the Indigenous Leadership Collective at UBC draw on their unique backgrounds and share their experiences with coming to UBC from places as far away as the Northwest Territories. Produced by Myia Antone and Sage Broomfield. 3:30PM: Interview with Cheryl Robinson who is the Acting Executive Director of the Urban Native Youth Association (UNYA). Produced by Myles Black. 4:00PM: Indigenous music playlist with Shoes on a Wire. Produced by Madeline Taylor. 5:00PM: The News Collective’s program, Democracy Watch, tackling local issues with an Indigenous focus. Produced by Alex de Boer and The News Collective. 6:00PM: Interview with Lori Snyder, a local Métis herbalist. Lori is from BC and found herbalism and education about indigenous plants has helped her reconnect to her Métis heritage. produced by Emma Ng. 8:45PM: An audio tour of MOA’s In a Different Light with soundscape recording of the audio played in the exhibition. In a Different Light is an exhibition that reflects on Northwest Coast Indigenous Art. It will run from June 22, 2018 to the spring of 2019. Produced by Amanda Sorensen. 9:15PM: As the BC government has approached its decision about passing or declining the renewal of 20 open net fish farms in unceded and traditional First Nations waters, Indigenous communities have voiced their dissent clearly. This documentary follows the events and discourses of a rally to end fish farm tenures, featuring the voices of Eddie Gardner, Dawn Morrison, and the present First Nations community. Produced by Sophia Sauvageau. 9:45PM: An interview with Harlan Pruden, a prominent Cree two-spirit activist based out of Vancouver about the role of two-spirit individuals within both indigenous communities and the queer community. Produced by Ande Laidman.